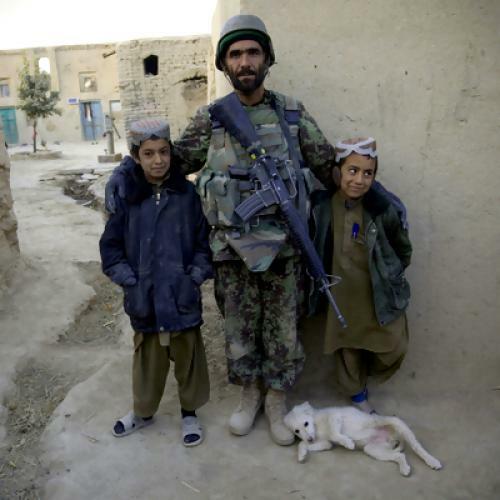 “The Taliban have already taken over in Kandahar! Come out onto the streets and see. There is no government there!” Or so Rangina Hamidi, the American-educated daughter of Kandahar’s mayor, Ghulum Hamidi, warned me in Kabul last month. Her remarks echoed a recent survey of 1,000 men in Kandahar and Helmand provinces. It found that 51 percent would prefer justice to be administered by the Taliban and 59 percent think the Taliban would do a better job of running the economy than the current Afghan government. Two white SUVs pulled up, the first filled with bodyguards. Hamidi got out of the second. White-haired and bespectacled, he looked like the American accountant he happened to be. He even wore brown Calvin Klein loafers. But his traditional grey Afghan baggy trousers struck a different note. We walked to a small park in a traffic-free traffic circle. Hamidi spoke English fluently but too eagerly, convolution often being the result. He worked for 13 years in the Afghan Ministry of Finance before fleeing the country. He and his wife raised five daughters and two sons in Virginia; his daughter Rangina graduated from the University of Virginia. Mr. Hamidi’s job now is not only dangerous, but also filled with mundane headaches. Afghan mayors handle the most thankless aspects of municipal administration—trash pickup, street cleaning, road maintenance, and parks. They have no jurisdiction over the police, or the supplies of power and water, or schools, all of which are controlled from Kabul by local line ministries, and all of which are failing in Kandahar. Mr. Hamidi begins by telling me that his first priority is simply to keep the city clean. There’s no sewage system, so this amounts to a Sisyphean task. There’s power only every other day, and without it, households have no running water, either. Schools in the suburban districts have been taken over either by the Taliban or foreign forces as command posts. Mr. Hamidi seems justifiably proud of his success in collecting unpaid taxes and making businesses register with the municipality. This has enabled him to boost the city’s funds significantly. Mr. Hamidi’s precision with figures is refreshing in a country where a governor typically cannot tell you the most basic statistics about his province, or a general about his soldiers. “We asphalted four kilometers of roads last year and this year we will do around thirty-seven kilometers,” he continues. Hamidi explains why households in Kandahar only have power every other day. It’s a common syndrome in Afghanistan, where a rapidly growing population and movement of rural people into the cities strains power capacity. Mr. Hamidi makes a worthy effort to stay on message, but when the conversation turns to land, the quicksand of Kandahari politics opens up. As elsewhere in Afghanistan, much of the local property belongs to the government, a legacy of the monarchy. Powerful men cut sweetheart deals for prime parcels, or simply take them. Mr. Hamidi proudly recounts his conflict with Hamid Karzai’s first cousin Hashmat Karzai, accused in a front-page New York Times article this year of murdering a relative. Then there is Hamid’s pride, joy, and pitfall. “All the Kandahari people are happy from Ay Nomina,” Mr. Hamidi says. “People are coming for picnic to see this area. Half of the city is that project. Ay Nomina is the lush gated community built by Mahmoud Karzai (the president’s brother, presently under investigation by the U.S. Southern District) on land sold to him by Gul Agha Sherzai, governor at the time. Mr. Hamidi says Sherzai had no authority to sell the 25,000 jeribs for the fire-sale price of $300 per jerib ($7.5 million). So Hamidi negotiated a revised price of $3,000 a jerib ($75 millon) and made Mahmoud’s company, AFCO, provide roads, mosques, clinics, schools, and services for the new suburb. Mr. Hamidi’s knowledge of Kandahar has no end. But as our interview draws to a close after three and a half hours, he hasn’t mentioned the Taliban once. The people who blew up his car, he says, aren’t the Taliban, but his Ahmadzai (Ghilzai Pashtun) opponents. I can’t test his daughter Rangina’s theory that the Taliban control the city, but her father talks only about intra-Pashtun rivalries. The next day, I go to see Major General David Rodriguez, the IJF (ISAF Joint Command) chief in Afghanistan. He comments on the Kandahar insurgents, “They adjust their tactics from IEDs to assassination of government officials.” But this shift away from indiscriminate killing of the population to killing people with capacity can also indicate that the insurgents believe the population is now with them. General Rodriguez acknowledges the American role in exacerbating some of the tribal enmities Mr. Hamidi mentioned. “It’s all about a balance of power. There’s a perceived imbalance that some of the tribes get everything and others don’t get anything. There is an effort to rebalance in the contracting arena. We are trying to spread the contracts the right way—include more people and broaden our engagement so we understand the full views of the population.” But Kandahari strongmen like Gul Afgha Sherzai and Ahmed Wali Karzai aren’t retreating quietly into their boxes just because we’ve suddenly decided that empowering them was a bad idea. It’s hard to say whether or not we’re turning the corner in Kandahar—or what the city will eventually look like, even if we are.